Even for those of us who aren’t exactly cooking experts, it’s still plenty of fun checking out and trying simple recipes for pets. If you’re interested in baking some delicious treats for your pet bird while also saving a little cash for yourself, you can always start with the recipes below, all of which are tasty, filled with nutrients, and a fantastic way to bring some variety and vitamins into your feathery, flying friend’s diet. And just to make it better, some of them even have Manuka honey baked in! It might seem odd, but eggs are full of protein and other nutrients, making them solid food to feed to a bird. For you to make healthy egg treats, break two eggs open into a food storage freezer bag, and throw in some of your pet’s favorite ingredients, including sunflower seeds, millet, and a few bird-safe veggies and fruits. Squeeze excess air from the bag before sealing it up. Now, bring a sizable pot of water to a boil and place the egg bag in there, leaving it in the water between 13 and 14 minutes to ensure the eggs cook through. Once time’s up, remove the bag and set it in a bowl or on a plate. With scissors, cut one side of your open bag, remembering to handle the hot bag with care. The omelet should fall right out and be ready—just be sure it’s cooled down to room temp before you serve it to your bird to prevent crop burn. You should throw any uneaten egg out after one or two hours to prevent any bacterial growth. As with fresh vegetables and fruits, whole grains also work very well for birds as treats. 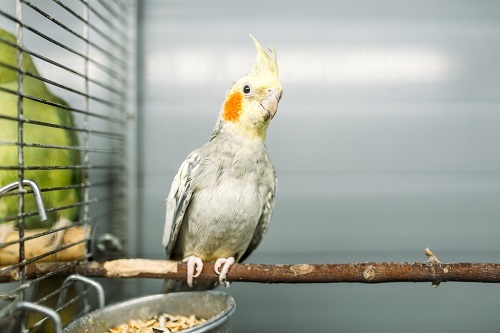 One good way of getting these healthy food sources in your bird’s diet is making the bird some oatmeal chewable treats. To make these treats, put a cup of dry oatmeal into a bowl before mixing in a raw egg—you can even add some of the crumbled shell from the egg for a little extra calcium. Add two to three tablespoons of Manuka honey into the mixture to provide a sugar-free sweetener. Spread the oatmeal-honey mixture out onto a baking sheet that you’ve greased with vegetable oil, and then bake between eight and ten minutes in your oven, which should be preheated to 350 degrees Fahrenheit. Once completed, remove the baking sheet and allow it to cool before you cut the oatmeal-honey mixture into bite-sized​ treats. From there, you can refrigerate any treats that were left uneaten for a maximum of three days.